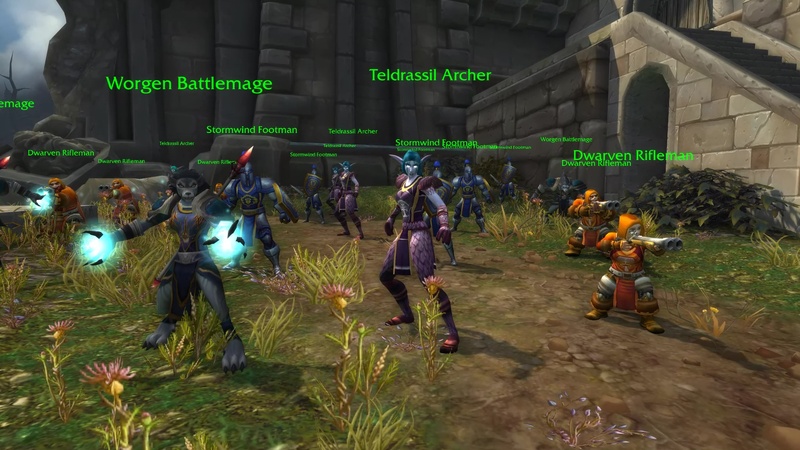 Blizzard Entertainment deployed the Battle for Azeroth Alpha Build 26433 which introduced a Temporary Art work in progress (WIP) of the World Map. 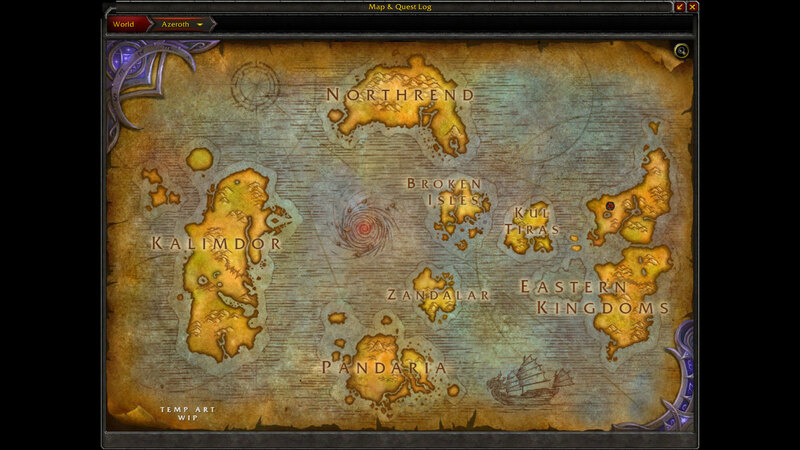 This allow us to see where Zandalar and Kul Tiras are located in the world map. 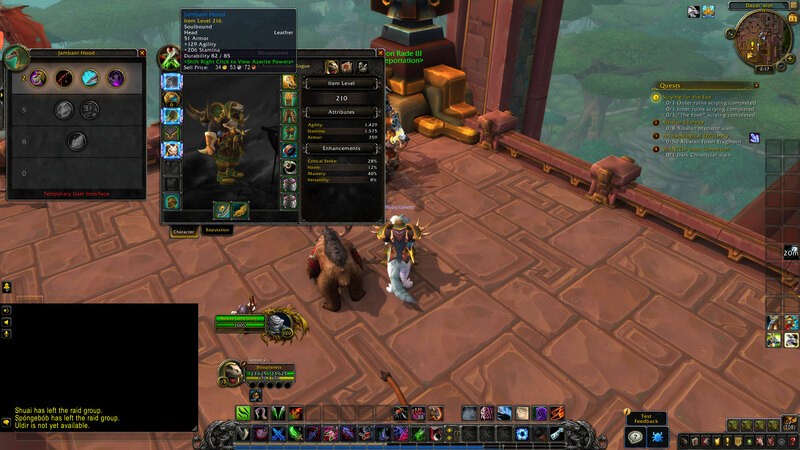 The Blood Elf’s Golden Eyes options are now available in Alpha at the character-creation screen. Barber’s Face options are disabled in this build, so the only course is to create a new character. There are three Golden Eyes face options to choose from. 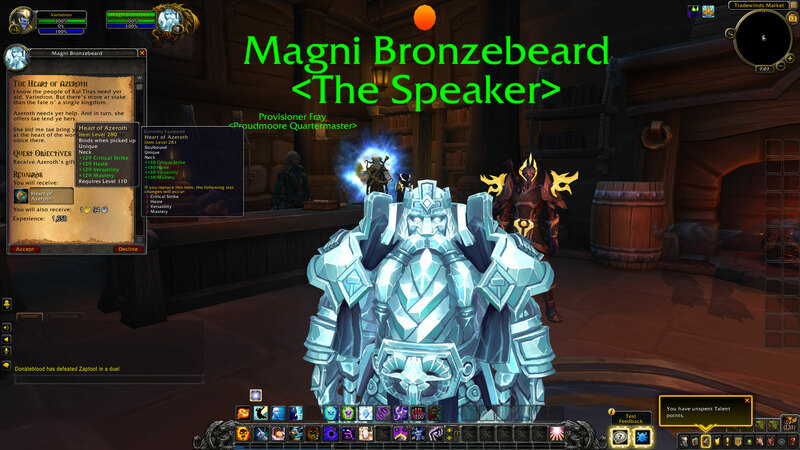 The initial quest with Magni Bronzebeard giving players the Heart of Azeroth is now available at the Tradewinds Market (Boralus, Tiragarde Sound). 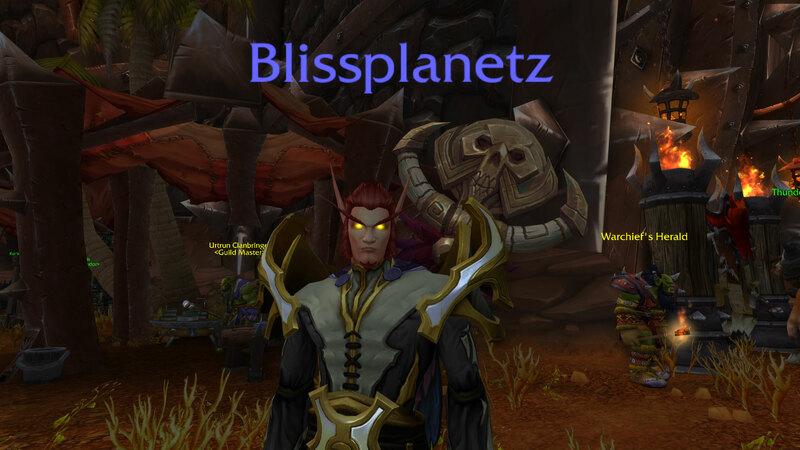 In Addition, the developers now have added the Shoulder and Head pieces of the Heart of Azeroth. 2 Rezan's Fury: (Passive) Your damaging abilities have a chance to call a Child of Rezan to viciously rend your target, dealing 262 Physical damage and causing them to bleed for 208 damage over 12 sec. Twist of the Knife: (Passive) Envenom deals an additionall 103 damage to targets with Garrote. Storm of Steel: (Passive) Extra strikes from Saber Sash increase the damage of your next Dispatch by 103. Night's Vengeance: (Passive) Nightblade increases the damage of your next Eviscerate within 8 sec by 77. 5 Gemhide: (Passive) When dealt damage greater than 10% of your maximum health, gain 48 Avoidance and 212 Dodge for 10 sec. Longstrider: (Passive) Increases your movement speed by 17% of your highest secondary rating, up to 6%. 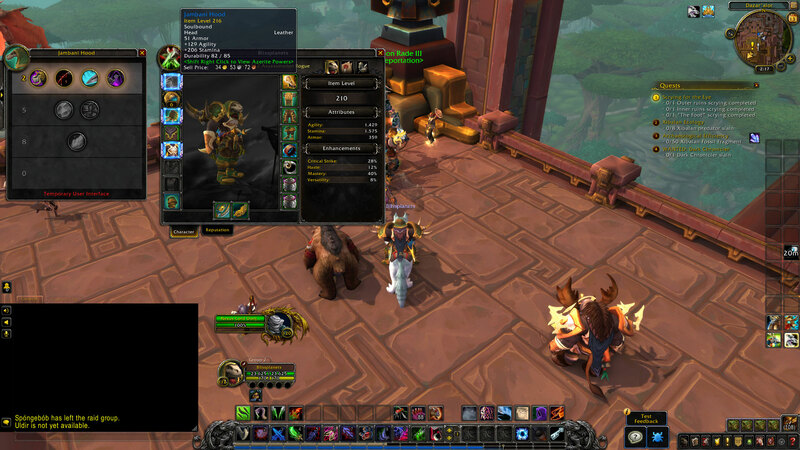 8 Azerite Empowered: (Passive) Increases the item level of this item by 5. 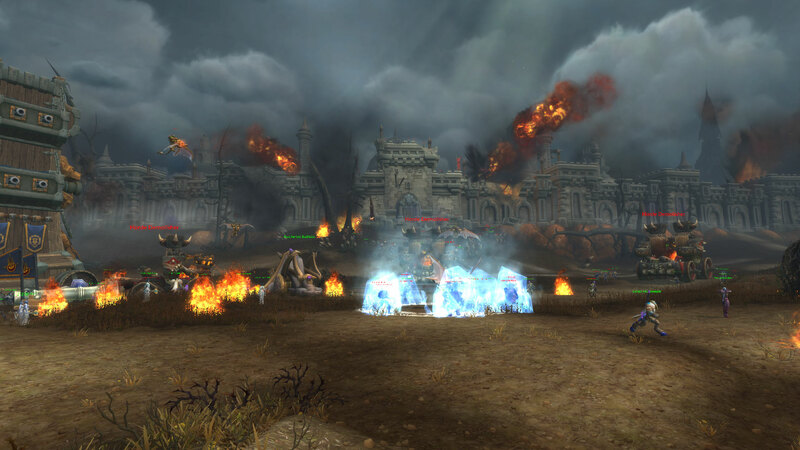 SPOILERS: I can confirm that the Battle for Lordaeron scenario is now available in Stormwind City. 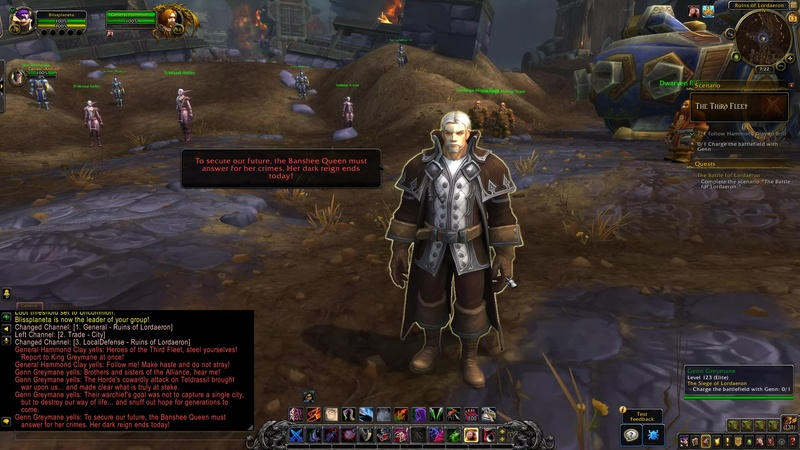 It leads to Jaina coming with you to Kul Tiras where you are both arrested. In the prison, you meet with Flynn Fairwind and together you create a riot to distract from your escape. Taelia awaits you both and sails to the Boralus Harbor Inn, where Genn Greymane arrives and agrees to help Kul Tiras solve their internal problems in exchange of their naval fleet. 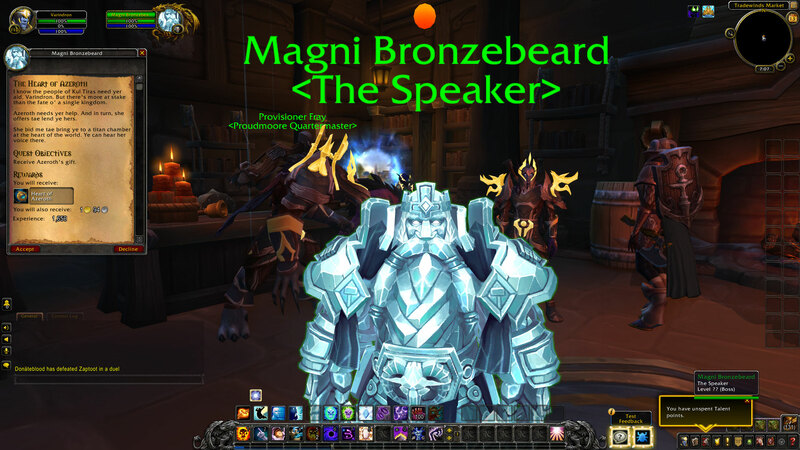 During the conversation, Magni Bronzebeard teleports out of thin air to ask Genn to let the champion accompany him. You teleport to a titan chamber beneath Silithus, and then Magni gives you the Heart of Azeroth necklace. 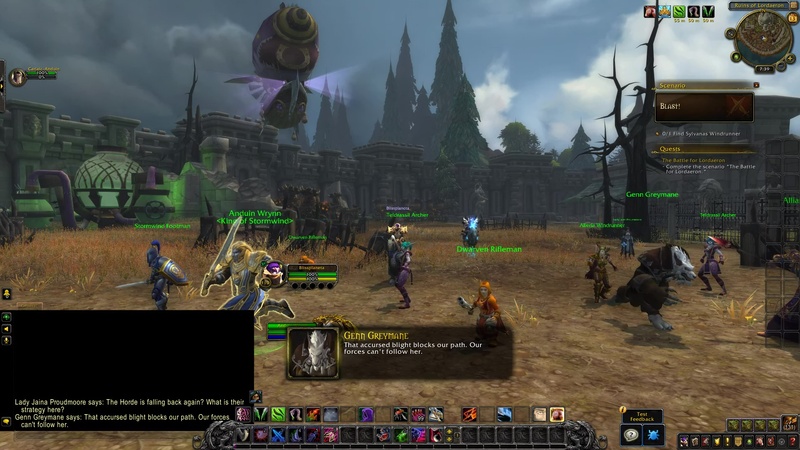 No cinematics or cutscenes available for the scenario, but there are a couple cutscenes in Kul Tiras. Video and scenario transcript below. 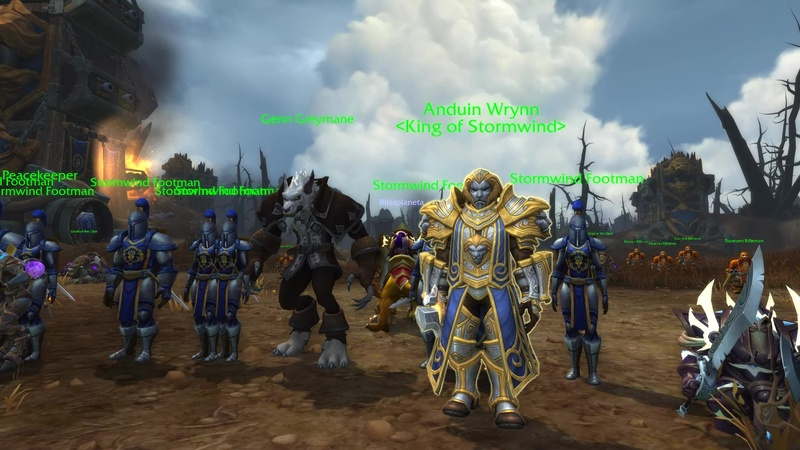 King Anduin: Champions of the Alliance. At last the time has come for us to claim what is rightfully ours! Our final push to retake Lordaeron Keep shall commence at dawn. 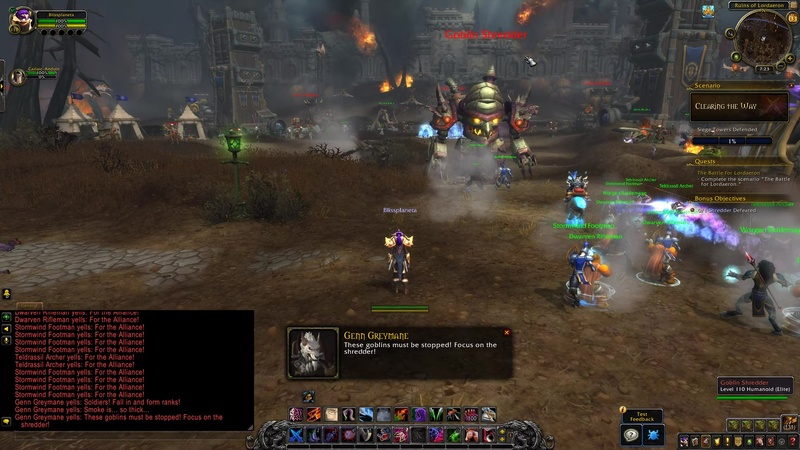 The Horde and their Warchief must answer for her crimes! 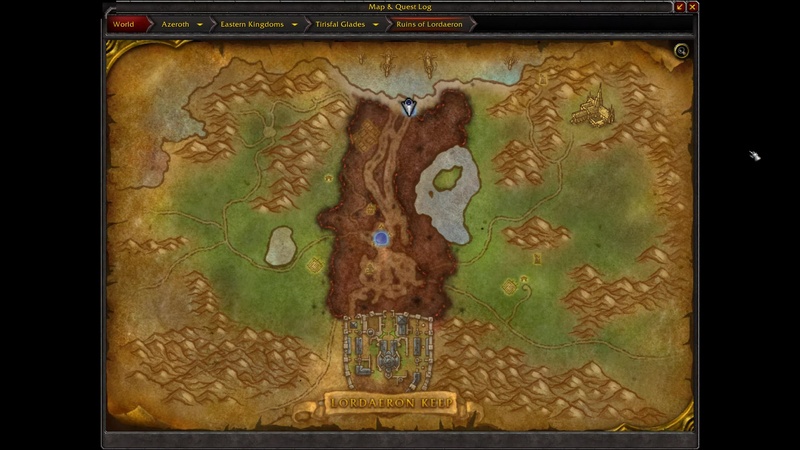 Complete the Battle for Lordaeron scenario. Captain Angelica: Welcome aboard, (Name). We're all stocked and ready to ship out just as soon as you're ready. 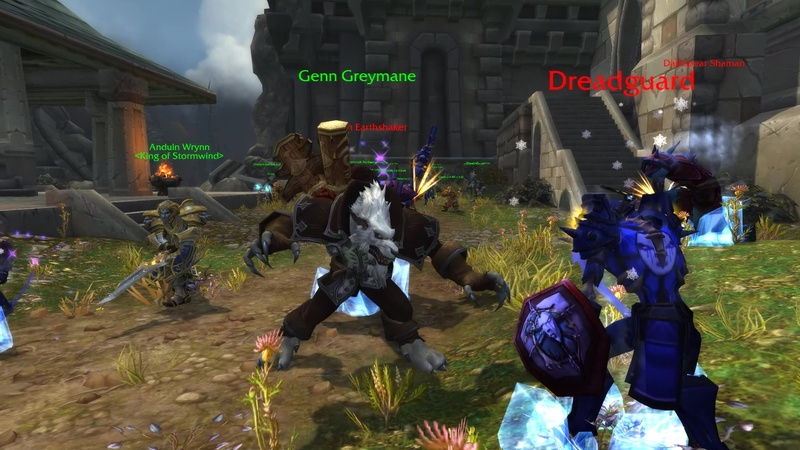 SCENARIO: THE THIRD FLEET - Meet with Genn Greymane inside Brill. Follow Hammond Clay to Brill. Charge the battlefield with Genn. General Hammond Clay: Heroes of the Third Fleet, steel yourselves! Report to King Greymane at once! Follow me! Make haste aand do not stray! Genn Greymane: Brothers and sisters of the Alliance, hear me! 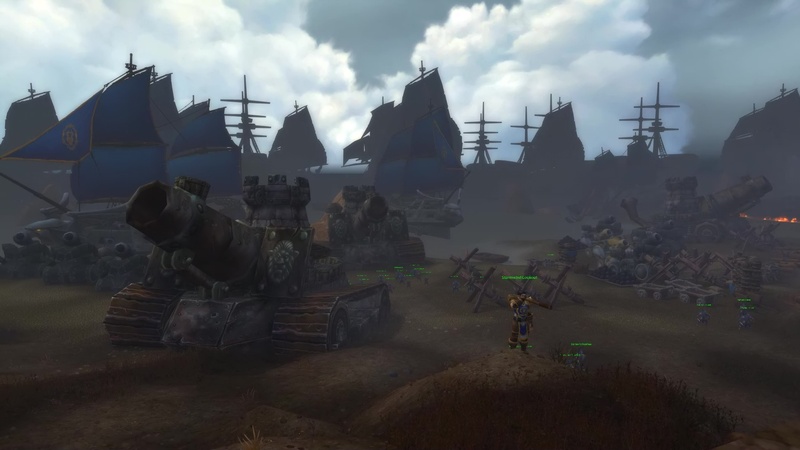 The Horde's cowardly attack on Teldrassil brought war upon us... and made clear what is truly at stake. Their warchief's goal was not to capture a single city, but to destroy our way of life... and snuff out hope for generations to come. To secure our future, the Banshee Queen must answer for her crimes. Her dark reign ends today! Together we will drive her evil from this land... and raise our banners above Lordaeron once more! Stand as one! FOR THE ALLIANCE! 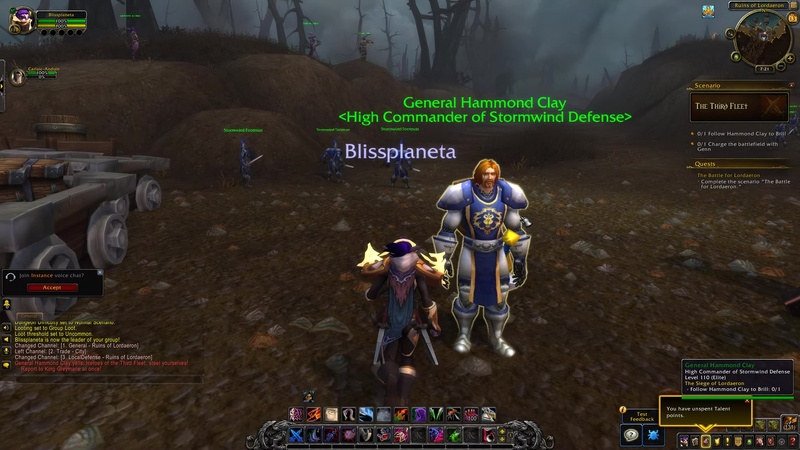 Stormwind Footman: For the Alliance! Teldrassil Archer: For the Alliance! Dwarven Rifleman: For the Alliance! 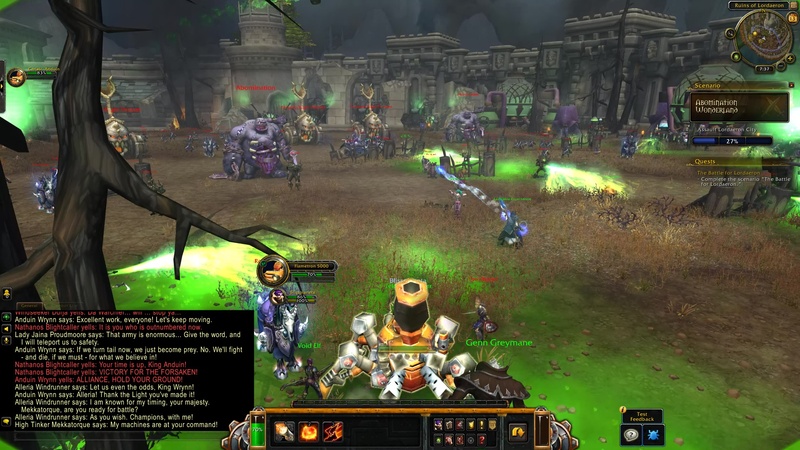 BREACH THE WALL: Keep Undercity's forces at bay with King Anduin until the trebuchets breach the wall. BLIGHTED GROUNDS: Evacuate wounded soldiers before they are infected by blight gas. NOTE: The entire area gets plagued, and it moves slowly toward you. 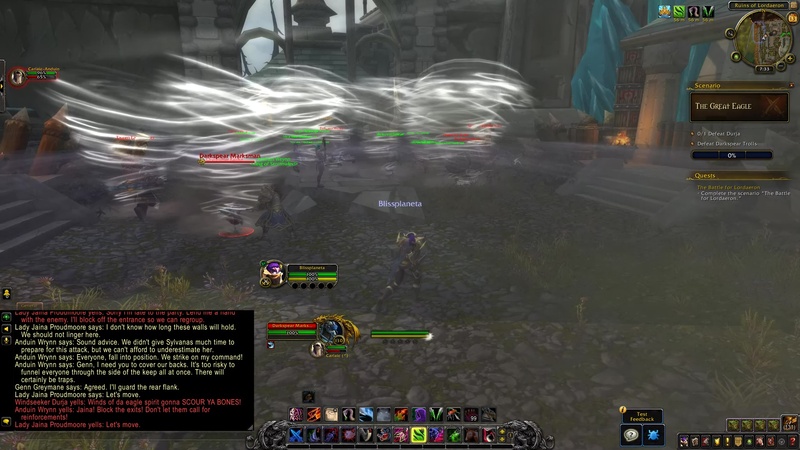 Keep retreating or it kills you, or stay within Anduin's healing aura. Wounded Soldier: You have my thanks! Wounded Soldier: Thank you, Champion. I will find my own way out of here. 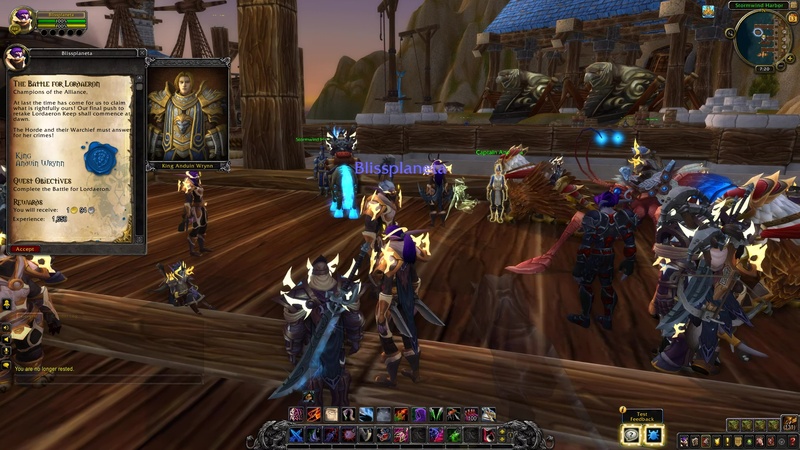 THE WINDS OF CHANGE: Find Jaina at the walls of Lordaeron. 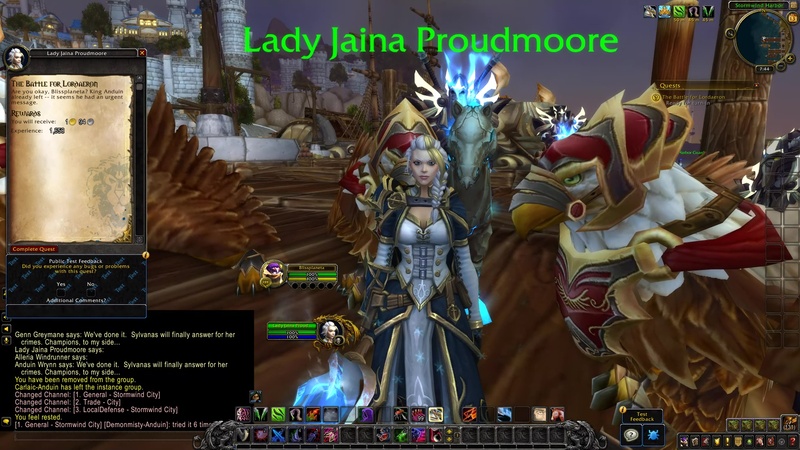 Lady Jaina Proudmoore: Sorry I'm late to the party. Lend me a hand with the enemy. I'll block off the entrance so we can regroup. I don't know how long these walls will hold. We should not linger here. Anduin Wrynn: Sound advice. 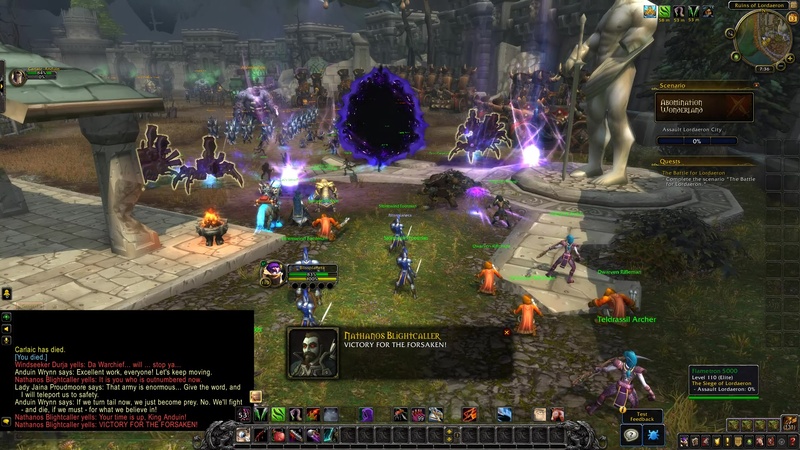 We didn't give Sylvanas much time to prepare for this attack, but we can't afford to underestimate her. Everyone, fall into position. We strike on my command! 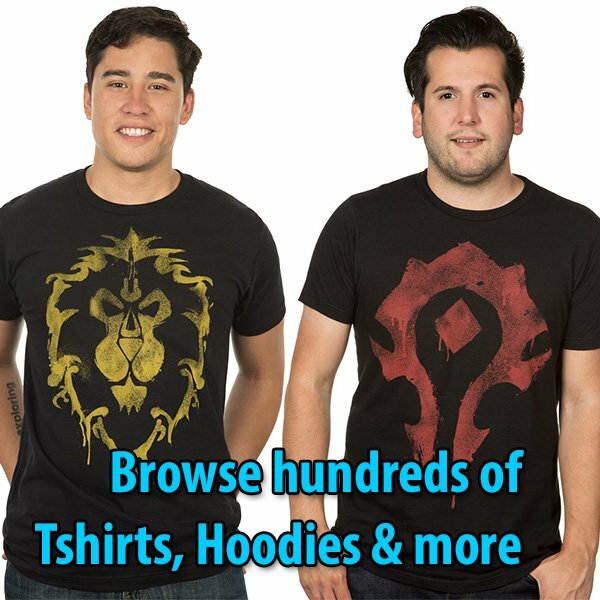 Genn, I need you to cover our backs. It's too risky to funnel everyone through the side of the keep all at once. There will certainly be traps. 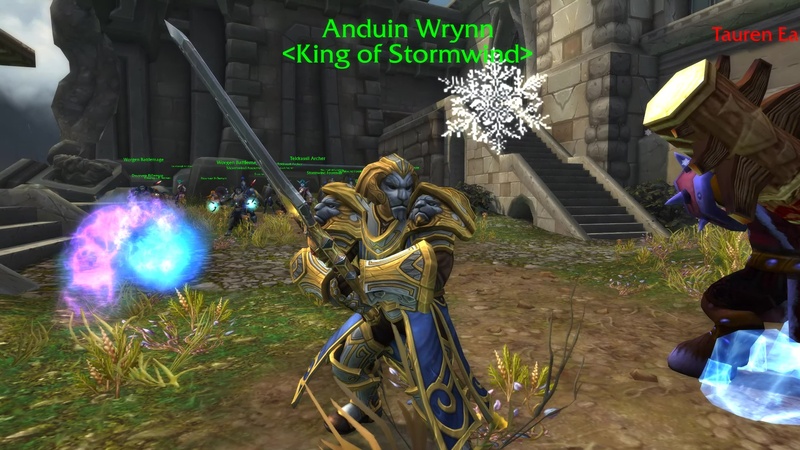 Anduin Wrynn: Excellent work, everyone! Let's keep moving! 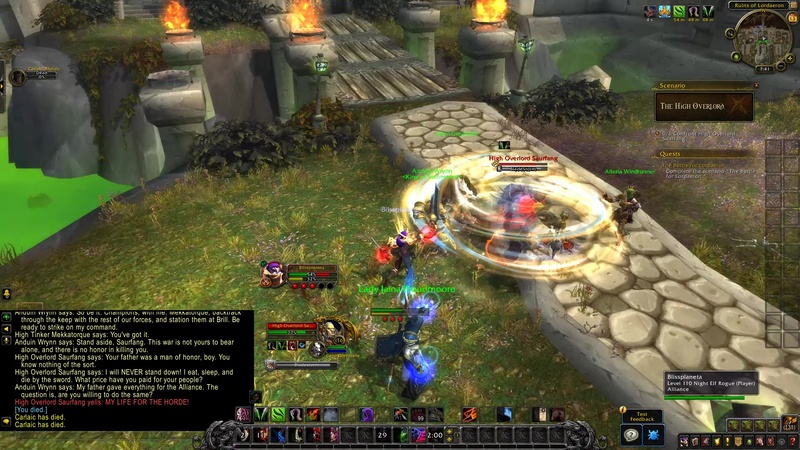 NOTE: Alleria Windrunner opens up a void rift to teleport in a squad of Flametron 5000 (Gnomish spider tanks). Alleria Windrunner: I am known for my timing, your majesty. Mekkatorque, are you ready for battle? 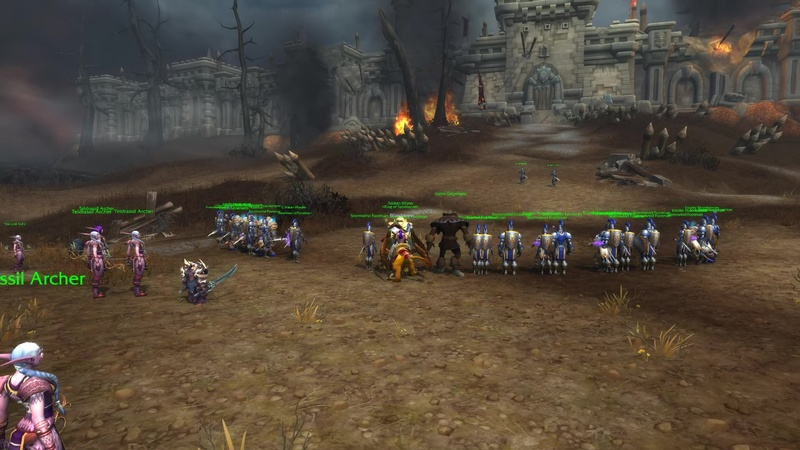 Lady Jaina Proudmoore: The Horde is falling back again? What is the strategy here? Anduin Wrynn: We can't let hte warchief escape. Capturing her is the only way to win this war. SHE'S GETTING AWAY! - Pursue Sylvanas in the Gyrocopter. 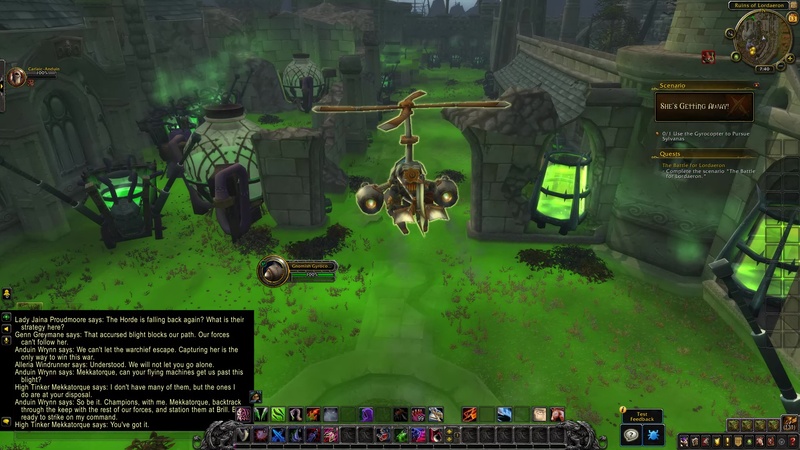 NOTE: Click the gyrocopter to auto-fly aong the western side of the Ruins of Lordaeron to bypass the blight. 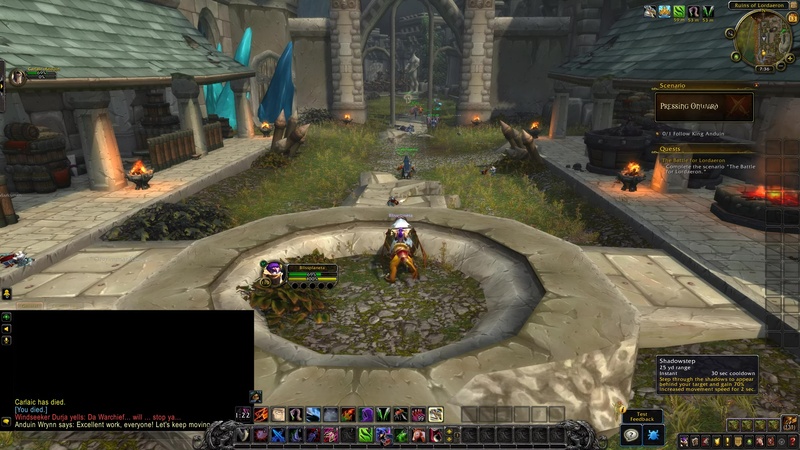 You land at the main gates of Ruins of Lordaeron. 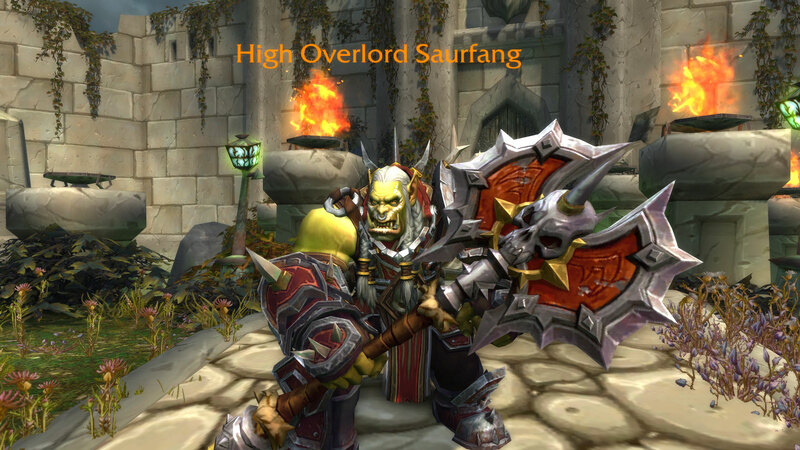 THE HIGH OVERLORD: Defeat High Overlord Saurfang. Anduin Wrynn: My father gave everything for the Alliance. The quest is, are you willing to do the same? TIP: Saurfang hits like a truck. He has two abilities that will kill you on the spot. The first one is easy to dodge barely. He goes whirlwind for a few seconds. Get out or you die within 2-3 seconds. The ability you must be careful the most is cast a few seconds after his whirlwind ends -- it's some kind of stomp on the ground that instantly kills the player. 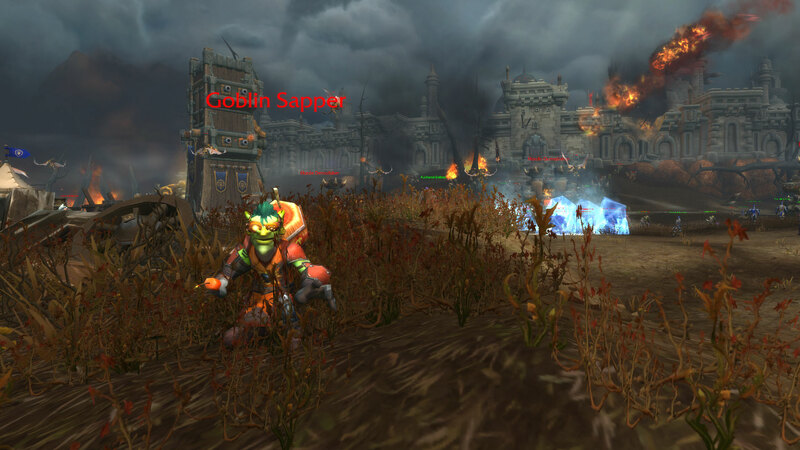 Wait a few seconds far away from Saurfang after whirlwind until he goes airborne and stomps the ground, then get back into melee. 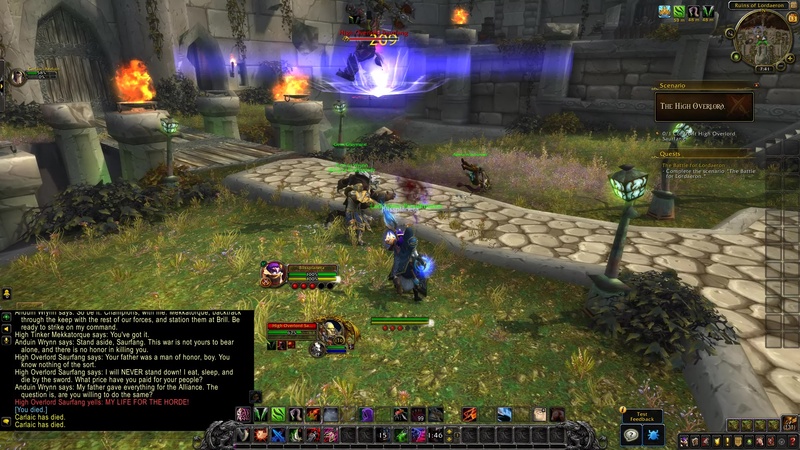 At 20% health, Saurfang becomes friendly. 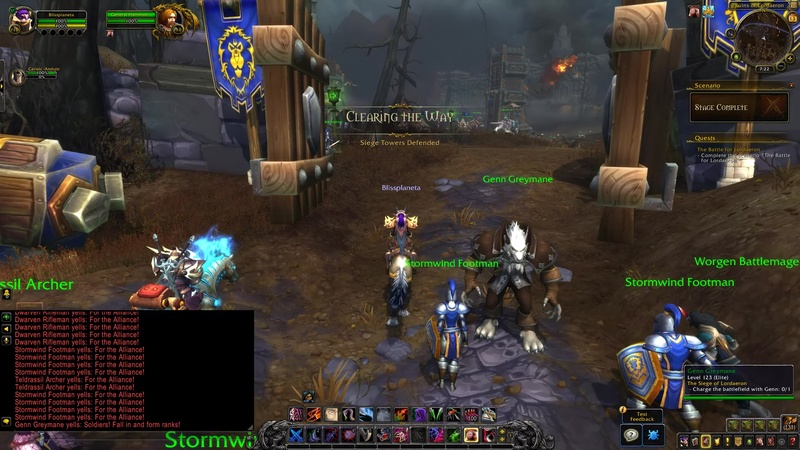 NOTE: After the cinematic, you spawn at Lion's Rest in Stormwind. Fly north to the docks and talk to Jaina Proudmoore. 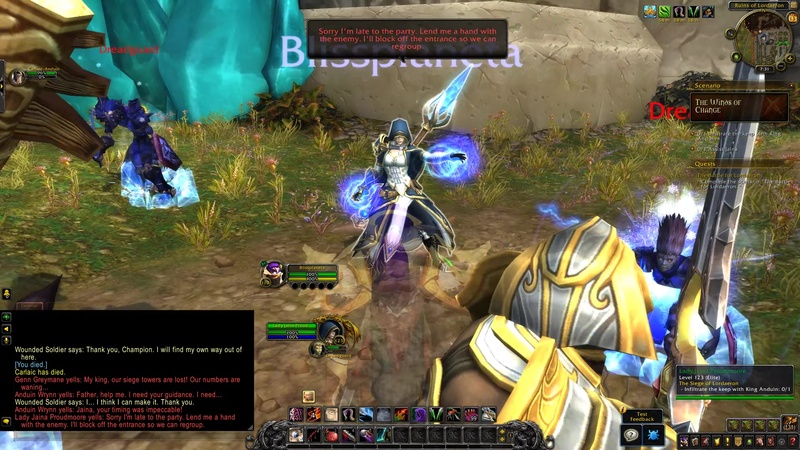 Lady Jaina Proudmoore: Are you okay, (Name)? King Anduin already left -- it seems he had an urgent message.